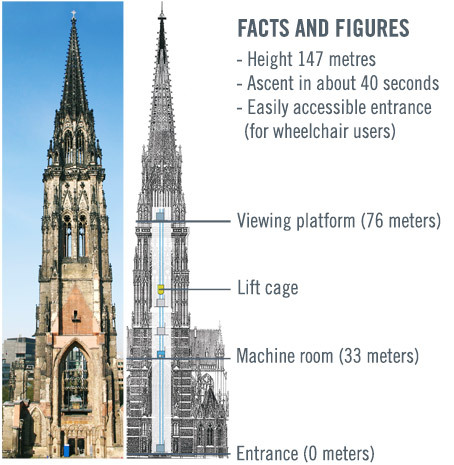 In 2005 a glass lift was installed which permits full access - also for the disabled - to the viewing platform at the 76 metre level of this spire which is so deeply steeped in history. The lift cage has three glass walls, affording exciting views already during the 40 second ascent. 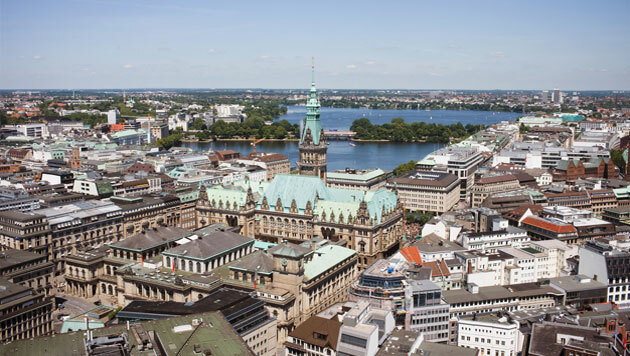 Once visitors have arrived at the viewing platform, they can enjoy a view of Hamburg’s inner city, the Town Hall, the Alster, the port, the cruise terminal, the Speicherstadt (a warehouse complex built in the late 19th century) and the HafenCity. 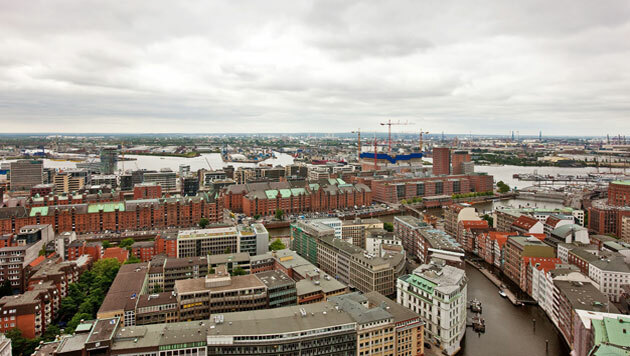 Historical photographs displayed on the viewing platform show the break in Hamburg’s history when the city was destroyed in 1943, and permit a comparison of the cityscape then and now. The glass lift at St. Nikolai Memorial is easily accessible and can also be used by wheelchair users. 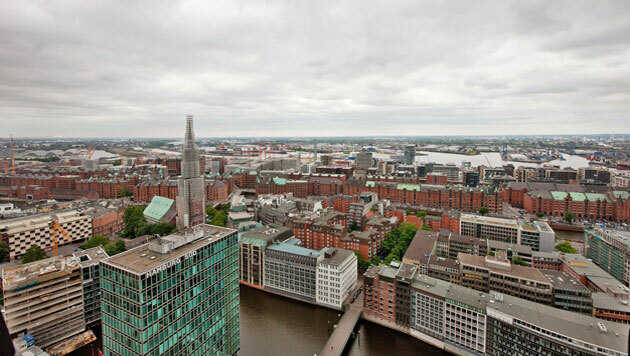 When it was finished in 1874, the spire of St. Nikolai Memorial, at 147.3 metres, was the highest church tower worldwide. Like the entire church, it had been designed by British architect George Gilbert Scott, one of the internationally most successful builders of historicism. 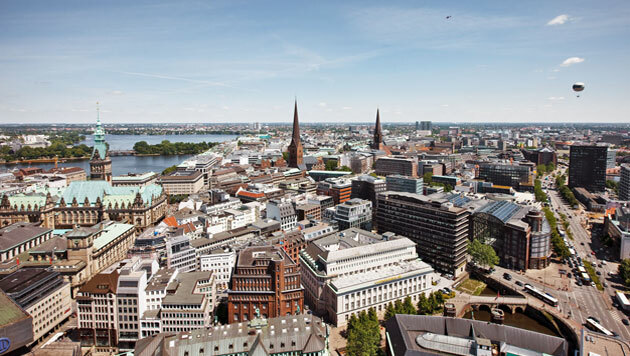 It was the spire of the former Hauptkirche which involuntarily initiated Hamburg’s decline and, oddly enough, survived destruction. 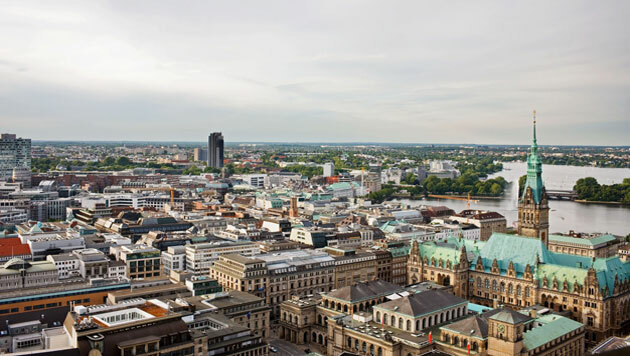 Being the highest building of the city, the spire served as a target for the British bomber fleet; they chose it as a landmark for their night-time air raids. Today the spire – still the fifth highest church tower worldwide –soars into the sky like an ‘admonishing finger’ and reminds us of the terrors of WW II. At the same time, it looks into the future, calling for tolerance and understanding among nations.